Deficiency of vitamin D is associated with the diseases rickets in children (bone deformities), as well as osteomalacia in adults (poor bone mineralization leading to weak, painful bones). It is estimated that as much as 40% of the U.S. population is vitamin D deficient. 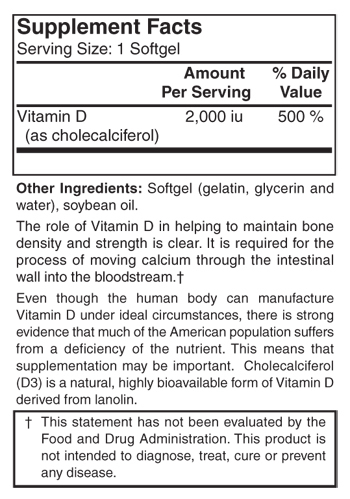 The human body can manufacture Vitamin D under ideal circumstances. It is able to synthesize pre-vitamin D3 in the skin when exposed to sunlight. The pre-vitamin D3 is rapidly converted into vitamin D3. Vitamin D3 is then transported through the blood to the liver and kidney where it is converted into the hormone calcitriol, the active form of vitamin D.
Numerous factors influence the skin’s synthesis of pre-vitamin D3 including, location, climate, sun exposure, skin color, age and use of sunscreen. Only a few foods naturally contain vitamin D including fatty fish and cod liver oil. Fortified foods such as milk and cereal are the major dietary sources of vitamin D.
Contains no sugar, salt, dairy, yeast, wheat, gluten, corn, preservatives, artificial colors or flavors. As a dietary supplement, adults take one (1) softgel daily, or as directed by a health care professional. treat, cure or prevent any disease. Please see your doctor before taking this or any other dietary supplement. © Vascure Natural Inc. All rights reserved.